The wizard lives on! Some of the most beautiful and exciting themes from all of the Harry Potter movies are beautifully arranged into one manageable work. Over a ten-year period, four different composers contributed poignant and truly magical scores to eight award-winning films. In less than 12 minutes the listener can experience “Hedwig’s Theme,” Nimbus 2000,” “Hogwarts,” “Quidditch,” “Harry’s Wondrous World,” “Fawkes the Phoenix,” “Harry in Winter,” “Dumbledore’s Farewell,” “Voldemort”, and the intense “Elder Wand” theme where Voldemort wickedly thrusts Dumbledore’s Wand to the sky! 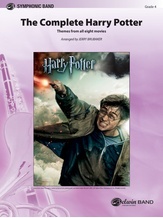 More themes abound including the mysterious “Lily’s Theme”, “The Friends,” “The Weasly Stomp,” and “Obliviate.” A fitting finale, John Williams’ compelling “Family Portrait” theme is used in the finale of the final film to send off future wizards as they board Hogwarts Express! (11:45) This title is available in SmartMusic.